How can SMEs benefit from an ERP solution? When it comes to maintaining the complex operations of a modern business, the software platform a company chooses to use is one of the most fundamental factors in the success of the business. With SMEs, this choice is particularly critical as limitations in budget and larger competitors translate into a serious need for efficiency and cost-effective design. With multiple ERP solutions available on the market today, choosing the right one requires considering many factors. For SMEs, one major factor is the choice between local and cloud hosting. A cloud-hosted ERP offers a number of advantages for SMEs over a traditional ERP on a local server. A cloud-based ERP is often more flexible and able to adapt to a growing and constantly changing business model such as that of a small or medium size enterprise. Startup and maintenance costs are also much lower with a cloud-hosted solution because they are frequently included in the license fee. The table below demonstrates some of the most important features an ERP solution can offer, divided into ten categories: Sales, Customer Relationship Management, Accounting & Finance, Marketing, Warehouse Management, Manufacturing, Purchasing, Services & Projects, Human Resources and Usability & Productivity. These categories encompass almost everything an SME might need to manage, develop, and evolve its business operations. 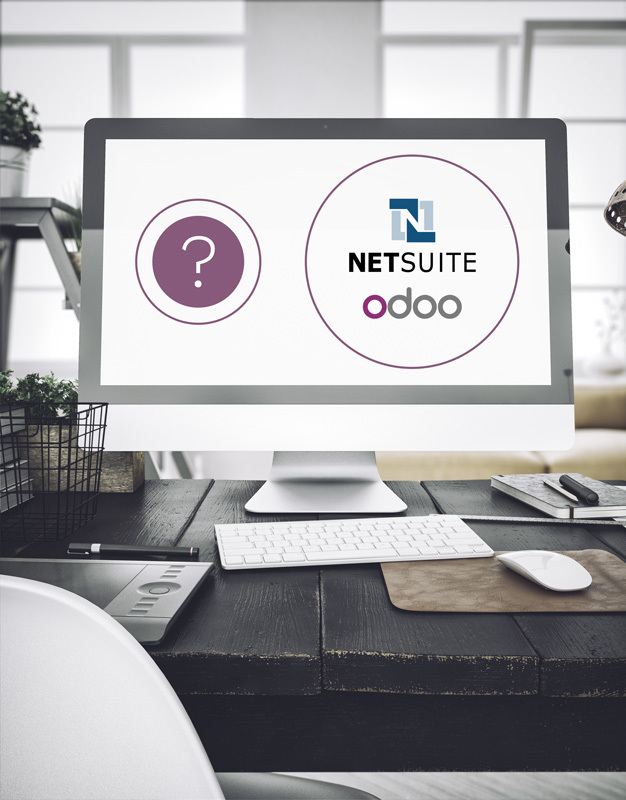 The comparison will demonstrate the availability of these features with detailed analysis for Odoo vs. NetSuite. NetSuite is an integrated solution for mid- to enterprise-sized businesses. NetSuite separates its business management software into four products: NetSuite ERP for inventory, supply chain, and financials; NetSuite CRM for sales and marketing; NetSuite Commerce for both web and on-site sales; and NetSuite PSA for project management. The different parts of the system can be purchased separately, which gives some flexibility to the customer. NetSuite also provides a version of its software for multinational organizations called OneWorld, which offers the four above services with additional features for multinational companies, including managing multiple subsidiaries, multi-currencies, multi-accounting standards, and tax requirements. In order to make a fair comparison of the features of each software, we took into account the entire integrated suite of NetSuite products (ERP, CRM, Commerce, and PSA). Odoo is an open source software that is available in three versions, two of which are local while the other is hosted in the cloud. More than 19,600 apps are available thanks to the multiple developments made by Odoo S.A. and its community. The cloud-based Online Edition of Odoo ERP offers a customized solution specifically designed to solve SME needs. In this highly modular solution, each business function is carried out by a dedicated app. This allows growing businesses to start with a few apps and to adopt more as their needs change and evolve.